Visit Travelodge Orlando Near Florida Mall hotel, close to Orlando International Airport, Universal Studios and Islands of Adventure, Disney World, Holy Land and SeaWorld. This smoke-free property is minutes from area restaurants. 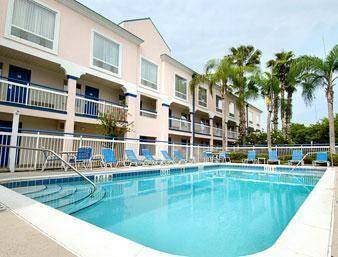 Enjoy complimentary continental breakfast, outdoor pool and business center. Rooms have complimentary wireless internet, microwave, mini fridge, TV, ironing supplies, desk and coffee maker. Attractions are Florida Mall, Mall at Millenia, Orlando Vineland Premium Outlets, Orlando International Premium Outlets, Orange County Convention Center, Florida Citrus Bowl Stadium, Ripleys Believe It Or Not, Osceola County Softball Complex and Paradise Cove.